UPDATED 3/11/19: AADC’s Ready-Vet-Grow program has now wrapped up, but if you are interested in future offerings of this program, please contact us! 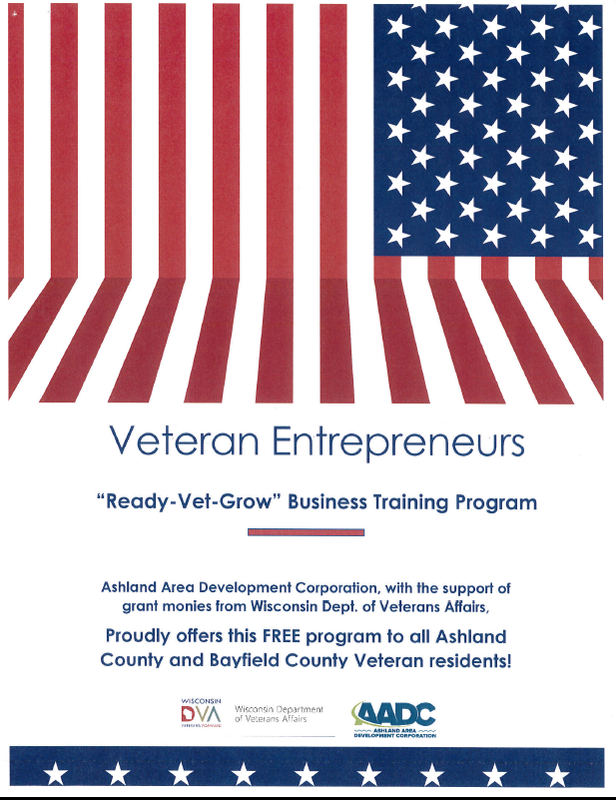 Ashland Area Development Corporation proudly presents “Ready-Vet-Grow” -- A new entrepreneurship training program for military veterans who reside in either Ashland County or Bayfield County, Wisconsin. The goal of this free program is to provide training and support to veterans as they learn how to develop and launch their own businesses in Northern Wisconsin. Ashland Area Development Corporation (AADC) recently applied for and received a grant from the Wisconsin Department of Veterans Affairs, which is funding this free program. The WI Dept. of Veterans Affairs established this grant with the “purpose of assisting non-profit organizations that provide entrepreneurship training, or technical, business or other assistance to veteran entrepreneurs to improve employment outcomes”. AADC Executive Director Betsey Harries developed this program to help our local veterans successfully start their own businesses. The program will provide instruction and on-going support as participants work toward completing a business plan and opening a new business. Program participants are NOT required to have prior experience with starting a business. 10-12 classes, covering all aspects of business development as well as veteran-specific resources. Classes will begin on the evening of November 29, 2018. Class schedule and topics will be finalized during the first class, and will be based on the needs of the group. Class presentations and mentoring from local veterans who are established business owners. Individual coaching and assistance tailored for each program participant. Additionally, up to four participants who develop a workable business plan during the “Ready-Vet-Grow” program will be eligible to receive a six-month lease, free of charge, in AADC’s Enterprise Center in which to operate their newly launched business (non-retail businesses only). A Review Committee will evaluate program participants’ business plans; selections will be based on the completeness and viability of the participants’ business plans, as well as currently permitted uses of Enterprise Center spaces. Each program participant selected to receive a lease to launch their new business in the Enterprise Center will also be eligible to receive funding to purchase trade equipment and advertising. AADC is dedicated to supporting area veterans’ success in their business ventures. Entrepreneurship classes provide the training, structure, and networking opportunities to succeed in business in the Chequamegon Bay area. All participating veterans will be supported to the fullest extent of AADC’s capabilities and grant funding, within the rules and regulations set forth by the Wisconsin Department of Veterans Affairs and the AADC Board of Directors. WHO MAY APPLY: Open to Ashland County and Bayfield County veterans who are interested in starting their own businesses. No prior business experience necessary! WHERE: Classes to be held at AADC’s Enterprise Center located at 422 3rd St. W, Ashland, WI. HOW TO APPLY: Call AADC at 715-682-8344, email ktaylor@ashlandareadevelopment.org, or stop in person at 422 3rd Street West, Suite 101, Ashland, WI 54806. An application is attached.